Chandlee and Sons Construction began demolition in the interior of an existing building located in the “Neighborhood of the Year” – the Old Fourth Ward area of east Atlanta. This is the first stage in the conversion of this former factory into the modern Lady Bird Restaurant and Beer Garden. On Friday, March 27, 2014, Chandlee and Sons began removing debris from this old factory. The outside space will easily transform into garden areas with seating and convenient parking. The interior has tall ceilings with windows placed high on the walls that allow light to fill the rooms. The building is located at 684 John Wesley Dobbs Avenue in Subarea Five of the Beltline, near the Eastside Trail which will soon connect to the twelve acre Gateway Park according to the city’s plan. Chandlee and Sons recently completed another restaurant and bar, the two-story, rustic Big Sky Buckhead – a ground-up construction project off of Roswell Road in Atlanta. Prior to this project Chandlee and Sons remodeled the flagship restaurant of Hank Cheatham’s franchise, Stuffed Burger, in Athens, Georgia. 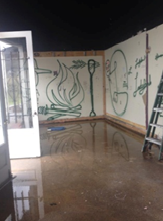 And in early 2013, Chandlee and Sons was chosen from all of the Atlanta contractors by the producers of the Spike TV show, Bar Rescue, to perform a thirty-six hour interior and exterior renovation of a bar in Tucker, Georgia. The owner of the Lady Bird found Chandlee and Sons Construction through their website. If you wish to follow the progress of this project visit chandleeandsonsconstruction.com or their Facebook page at www.facebook.com/chandleeandsonsconstruction.